With the upcoming WordPress 4.2 release, widgets have been added to the growing list of HTML5 supported markup. 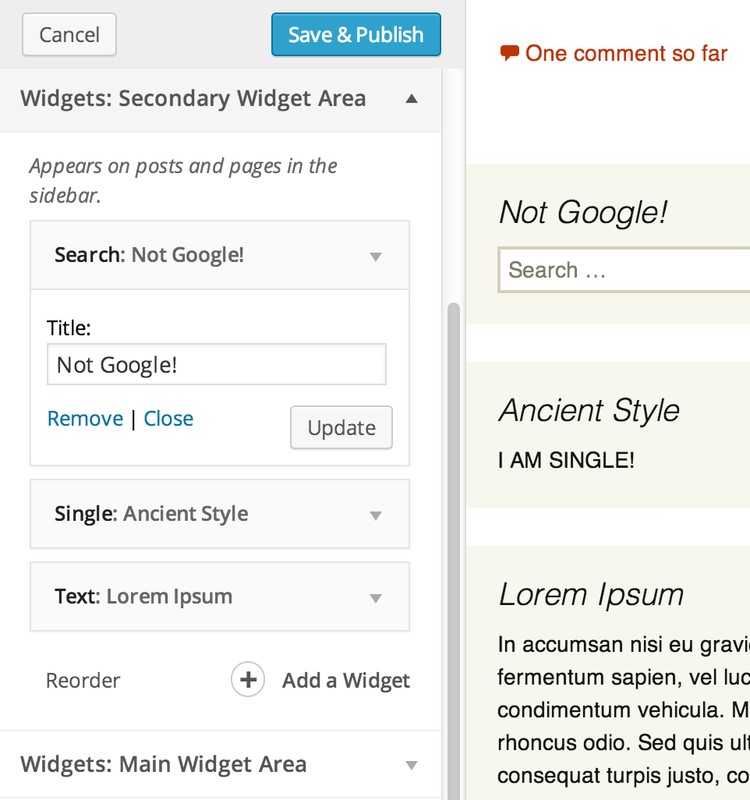 Once you’ve added HTML5 support for widgets, WordPress will use the <aside> element, instead of the generic list markup. For forward compatibility reasons, the second argument cannot be omitted when registering support. Otherwise, a theme would automatically declare its support for HTML5 features that might be added in the future, possibly breaking it visually. Customizer control sections for sidebars are shown and hidden dynamically when the preview window is initially loaded or when navigating the site within the preview window, based on whether or not the sidebar gets rendered in the previewed URL. (You may not know this, but you can navigate your site by clicking links in the preview window.) Only sidebars which can be previewed will be shown in the customizer panel. Likewise, widgets that are not rendered in the preview (for example, by means of Jetpack’s Widget Visibility module) will appear in the Customizer as semi-transparent. While all themes and widgets should work with Widget Customizer, for the best experience the themes and widgets need to indicate they support live previews of sidebars and widgets. Without such support added, each change to a sidebar or widget will result in the preview window being refreshed, resulting in a delay before the changes can be seen (settings default to transport=refresh). To enable a much more responsive preview experience, themes and widgets should indicate that they support Widget Customizer live previews; this will update the relevant settings to use transport=postMessage, the updated widgets will be loaded via Ajax, and the widgets will be re-ordered via DOM manipulation. Along with themes needing to indicate support for live-previewable sidebars, widgets must also indicate that they support being live-previewed with Widget Customizer. 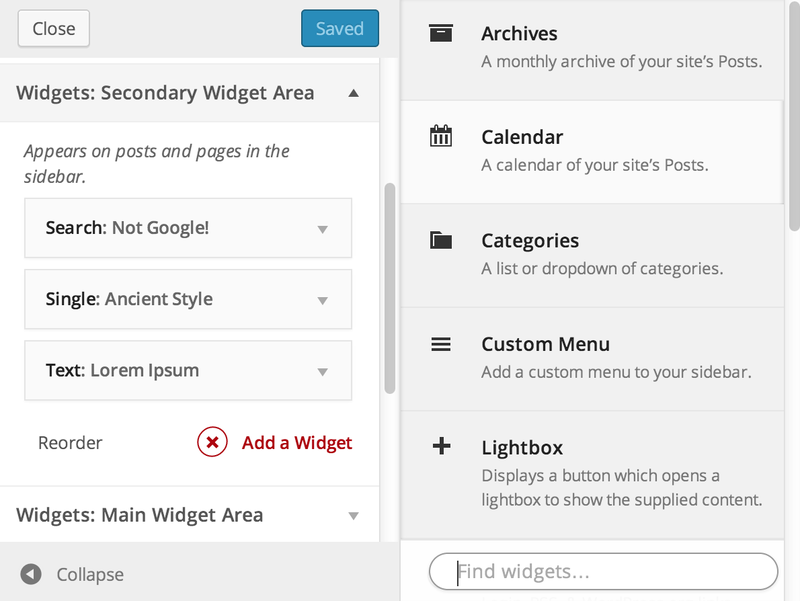 When updating a widget, an Ajax call is made to re-render the widget with the latest changes, and then the widget element is replaced in the sidebar inside the preview. If a widget is purely static HTML with no associated script behaviors or dynamic stylesheets (like all widgets in core), then they can right-away indicate support for live previews simply by including 'customizer_support' => true in the array passed to WP_Widget::__construct(). As with sidebars, if a widget has dynamic behaviors which normally only get added when the page first loads (such as a widget which includes a carousel), then a script needs to be enqueued in the Customizer preview which will re-initialize the widget when a widget is changed. The sidebar-updated and widget-updated events get triggered on wp.customize when sidebars and widgets get updated, each being passed the sidebar ID and the widget ID respectively as the first argument in the callbacks. For a full example demonstrating how to add theme support for live-previewing dynamic sidebars and how to add support for JS-initialized widgets, see this annotated Gist. In addition to wrapping up the keyboard-accessible widget reordering (#21), there is the dilemma of how to handle wide widget form controls (#18); various solutions have been proposed for how to display a widget control which does not fit within the customizer panel. The other open issues are enhancements or open questions which may or may not need actioning. While the plugin was first conceived by me (@westonruter) and I’ve been the lead developer, a ton of valuable input and contributions have come from @shaunandrews, @michael-arestad, from my X-Team colleagues (@johnregan3, @akeda, @topher1kenobe), and from others in the community (@bobbravo2, @topquarky, @ricardocorreia). Development on the plugin has been done on GitHub, with the WordPress.org repo serving as a read-only mirror.